Today's Draw: The King of Cups from the Tarot of the Holy Light. Who gets to decide what the word of God is? And if you don't believe in God, who tells you what to believe? What do God's confidantes have that you don't have? 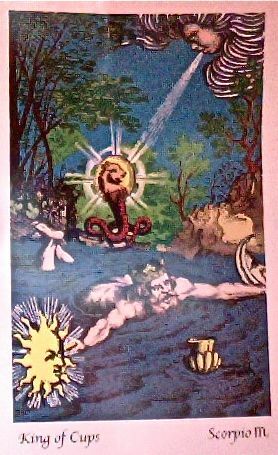 In this deck, the King of Cups is equated to a shaman. Technically, a shaman is an intermediary between the human world and the spirit world. Their functions are far ranging, from healer and counselor to diviner and ceremonial leader. He is both medicine man and holy man, a spiritual guide and a priest. You wouldn't find a shaman in a church or temple, however. His church is in nature. Today's shamans are more healers than priests, though I'm sure there are plenty of aboriginal tribes still around who count their shamans as holy men. From prehistoric man through Iron Age man, there was no "God" as we think of God today. Instead, they worshiped animal spirits, ancestral spirits, elemental spirits, the divine feminine, and the multiple gods of mythology and polytheism. The history of "not a Judeo-Christian God" is significantly longer than the history with one on this earth. It's interesting to note that as far back as man has existed, we've had a tendency to entrust our communication with the higher power to a mediator, whether a shaman, priestess, pastor or priest. This is how religions are built. A handful of these special people have communicated with a higher power, had mystical experiences, written texts, interpreted texts, developed a set of morals and values and brought their takeaway to the people, who then adopted the input as beliefs and it became a religion. Whether you worship a bear, Zeus, Allah or Jesus, that's how it happens. Much of what people believe in today is based on the input and interpretations of men who lived a couple thousand years ago. 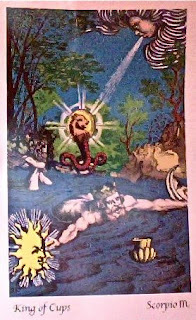 But we're talking about spirituality and a kind of "2012 new world order" this week and in the context of both of those things, I think the King of Cups has come here today to tell you that YOUR line to God is just as strong as those men's who lived thousands of years ago. It's just as reliable as your community's most beloved pastor's. And it's just as profound as anything you've ever read in a book. Which is not to take away from the studies and knowledge of priests and pastors and the like. They know their scripture better than us, no doubt. But talking to God isn't about scripture, is it? It's about learning to hear and recognize the voice of something greater than ourselves. Which is a capability we're all born with. It's not like holy men are born with a gene we don't have. They just have more of a discipline and practice of communicating with spirit than we do. But that doesn't mean we can't catch up to them and even surpass them in our communications. So how do you do it? Well, prayer and/or meditation work. But what many may not realize is that we don't always hear clearly and the higher power doesn't always speak in words. You may get messages in symbols or pictures, feelings or intuitions. There are a few things that help set the stage. One is being in a quiet place where you can hear your thoughts. While you can connect anywhere, another is being in a place where you think you'll more easily commune with the higher power. For some, that's church. For others, it's nature. Both offer the kind of profound silence and stillness you're looking for. Then state your intention that you want to talk to to God about whatever it is. Visualize and feel the light and presence of the higher power surrounding you and just set yourself on "receive". Then, and this is the most important part, trust what comes to you, whether it's a feeling, thought, picture, words or even a smell. The more you practice, the more fluent the conversations will be. A couple of years ago the American Religious Identification Survey (google "ARIS survey") showed that American's are becoming increasingly less religious, identifying themselves as having no religion or being spiritual, but not religious. In fact, the number of people identifying as having no religion has doubled in the past 10 years. These are the people we might call "lapsed Catholics". I know a lot of them. They have faith in God. But they no longer have faith in the church. They've never been told they don't need the church to know God, in fact quite the opposite.Truth is, they can do the same thing those men 3,000 years ago did when the whole earth was just getting to know "God"...find out for themself. So me and my Kingly friend here are suggesting that all the answers and love and communication and signs you seek are within your reach. Don't stop talking to God because you stopped talking to the church! And don't give up on a higher power just because you don't believe in God. The "force", the energy, the power, the being, the entity—whatever you call it—has been here all along. In all sorts of flavors and colors. Tens of thousands of years before the first priest came along, he/she/it was communicating on the wind you see blowing into the card above. In the cycles of the sun and moon. In the reflection of the ripples on the water. In the rustling of the trees, shape of the clouds and visage of a bear. In fact, that power was communicating long before man ever existed, just for the insects and dinosaurs to hear. The 2012-ness of this is that, like the study suggests, we're trending toward being our own self-intermediaries with spirit right now. If we want to have that relationship, it's time to find our own vision. And, if you read yesterday's post, respect the visions of others while you're at it, whether their vision is their own or the church's. Can the earth survive 8 billion different visions of God? I think it already does in one sense. It doesn't have to be organized to resonate in our hearts. And it doesn't have to be a battleground, either. Because everyone I know who has their own mainline to God says the same thing—it's all light and love. And the more we know it and understand it and feel it straight from the horse's mouth, the better off we'll be.